This is a story of two unsophisticated Iowans who have developed a part of the island of Bequia, known as the jewel of the Windward Islands. The author, Patricia Fischer, felt compelled to tell the stories of how they held sway over the crises, follies and foibles, to maintain the charm of paradise. 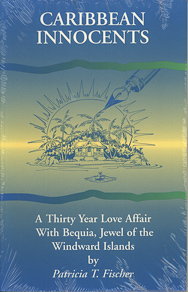 This is a story of the evolution of Bequia, an island in the Caribbean. When it begins, Bequia is a refuge from civilization, without electricity, phones, and regular transportation facilities. The author, her husband and some of their friends build a small hotel on the island in 1963. Through the next thirty years, they have many (mis)adventures. Some occur on the island and others involve their getting back and forth from their original home in Vinton, Iowa. With no plane or any other travel service to the island, getting back to Iowa involves a boat, some land transportation and getting to the plane on time. A lot of alcohol is consumed by all, although there are no serious consequences to the lubricated revelry. Now, the island is developed, with all of the modern conveniences, including an airport. While the author understands the advantages of being a modern tourist destination, it is clear that she laments that fact. This is the story of a group of Iowans who escape the Iowa winter and end up starting a thirty-year love affair with an island.